Group Ticket offer back for Easter! 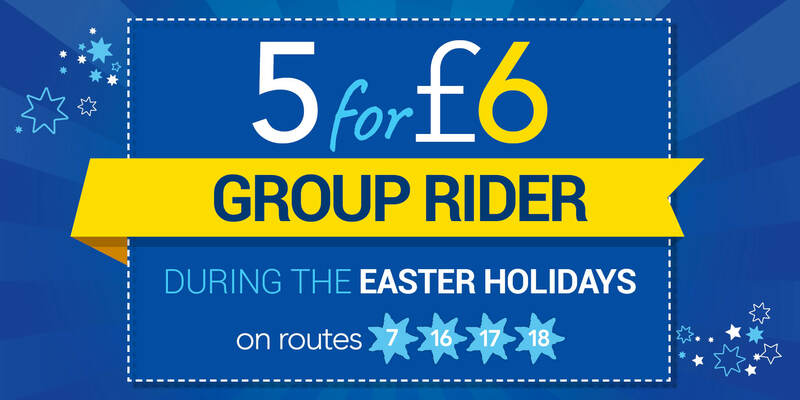 Saturday 6th April marks the return of our popular '5 for £6' group ticket for the Easter Holidays. Valid for use on Bluestar 7, 16, 17 & 18, after 0930 weekdays and any time at the weekend, this ticket is perfect for taking the kids out to keep them entertained during the school break. Please note there are also slight alterations to our some of our weekday timetables, which will run HOL or NSch journeys as listed on our printed booklet/PDFs and roadside timetables. (Our online and journey planner times update automatically).